Educators are keen to leverage YouTube for teaching and learning but frequently rely on videos for homework, flipped learning, as a tool for classroom discussion, and curating their course videos via playlists. These are of course all fantastic uses of the platform. But I often hear that educators want to create their own YouTube channel but with little time to learn how to do it. You can learn to create a channel with your own teacher or student-made videos. It will take time! This Slides deck is a step-by-step guide for how to set up your channel, with some of my personal (though not authoritative) suggestions for developing your channel. While it does not get deep into details of registering as a Google Partner and setting up AdSense, it is a starting point. If you can get through this process you will already have the tools to take your channel further by creating a community and monetization. (if your channel becomes even moderately popular why not make a few dollars in the process?) Feel free to add questions and/or suggestions in the comments section below. To access the Slides deck click this link or the image above. Keep in mind that YouTube has reinstated its “Editor” feature and will be redeveloping this and other features of the platform in over 2019. There is plenty to be excited about for the teacher yearning to create a channel that works for their students and wider PLN. 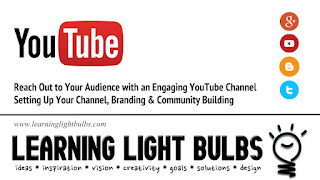 Note: The end of the Slides deck has links to further learning via the YouTube Creator Academy and other offerings from YouTube. Have a look and get a great channel started! A worthy to read information. I will follow this tutorial to make slides.